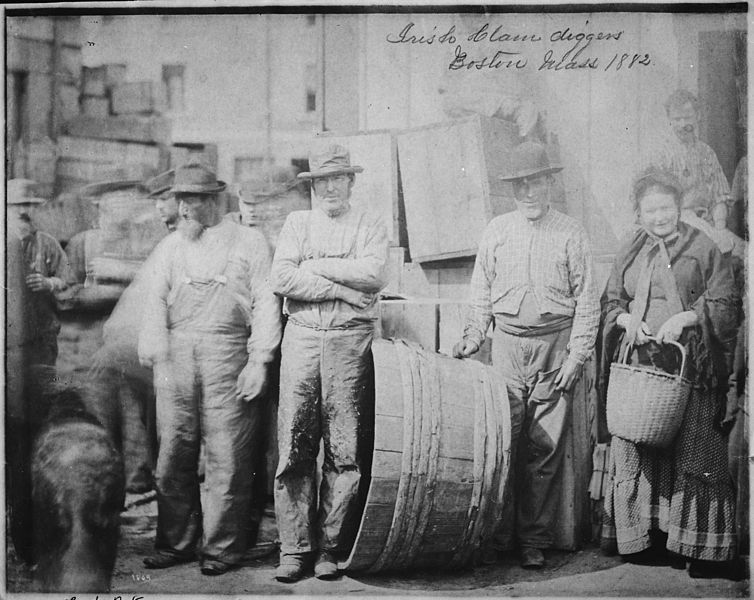 Irish clam diggers pose on a Boston wharf in 1882. While being a few decades after the Curtis family exchanged letters, it is presumed that the circumstances of these immigrants were similar to that of those in Pennsylvania. Today families that are spread across continents use Skype, Whatsapp, Viber, and countless other mediums to maintain a connection even when physically apart. But what did immigrant families of the past use to keep in touch with their relatives back home? Handwritten letters served as the perfect vehicle to exchange stories of fear and opportunity between newly arrived immigrants and those who remained in their homeland. A look at the mid-1800s reveals letters written between mothers, sisters, brothers, uncles, and cousins of the Curtis family, spread across Ireland and Pennsylvania. These letters tell the stories of hardship and famine alongside opportunity and strength, as a family strives to maintain its connections from thousands of miles away. But most importantly, these letters expose the everyday struggles of immigrant families, to share news of home, financial stability, and opportunity for success across borders – struggles all too familiar to the immigrants of today. Before taking a look at the Curtis family letters, we must gain some insight regarding the context in which they lived, both in Ireland and in Philadelphia. Mid 19th century Ireland faced dire circumstances, as a North American fungus destroyed Irish potato crops. The crisis was more than a crop failure, it revealed the social, economic, and political oppression of Irish Catholics in what is known as the Irish potato famine. Years before the famine, Britain’s discriminatory colonial policies allowed for “confiscation and transfer of lands to British colonizers” (Takaki, 133) and other policies that left the Irish with few choices as starvation led to massive numbers of deaths across the island. In A Different Mirror, Ronald Takaki explains that the situation led many to leave their homeland to start new lives. To read more about the context the Curtis family found themselves within click here. As you read this letter, consider the following questions. What role did religion and famine play in the lives of the Curtis family? Think about what it means to be “forgotten” in the context of trans-continental families (that being families that are spread across continents) – how is its opposite, remembrance, displayed? How do you remain connected to your family and their culture and traditions? While Hannah Curtis writes from a pre-exodus perspective, just one year later in April of 1846 William Dunne writes his nephew John Curtis to describe the mass exodus itself and the demolition of Ireland that catalyzed it. Take a look at this letter to explore the creation of immigrant enclaves and networks. In this letter, John Curtis joins a great number of Irish-Americans by moving to Philadelphia. Among other cities, Philadelphia served as a hotspot for Irish immigrants. Why do such immigrant enclaves develop? What advantages may they give immigrants? William Dunne finds out that John Curtis had managed to bring his parents over to America? What does the process of familial sponsorship look like today? What effect may such connections have on a greater immigrant network? To explore more Curtis family letters visit the Historical Society of Pennsylvania site.